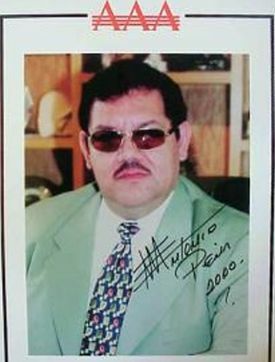 Antonio Peña (born 1948 - October 5, 2006) was the founder of the Mexican professional wrestling promotion AAA, which was revolutionary in the way matches in Mexico were presented, and reached its height of popularity in the early 1990's before the downturn of the Mexican economy. Antonio Peña was a luchador who fought under the names Kahoz (a name later used by Astro Rey) and Espectro de Ultratumba (where he won the mask of Impacto). Those two masks are frequently seen on AAA TV, in a bookcase of important AAA masks. Pena returned to the Espectro identity as a surprise for a one match appearance against Cibernetico in the 2000s, and the same character was featured in the AAA video game as the near invincible final boss character. Pena is far more famous as a promoter. He began his office career in EMLL in a minor role, but his passion for lucha libre caused him to create ideas for characters which would be used by the programming department. The Lutteroth family eventually figured out it was Pena coming up with the ideas and gave him a much greater role. The promotion caused tension between Pena and the existing hierarchy. Pena became frustrated with EMLL's unwilling to modernize, and secretly made a deal with Televisa to create his own promotion. Pena left (along with many luchadors, led by top stars Konnan and Octagon) in 1992 to form the Asistencia Asesoria y Administracion promotion. AAA had great success in their early years, in both Mexico and the United States. The promotion fell on harder times in the mid to late 90s, due to a talent exodus and general burnout. The promotion struggled for many years before turning it back in the mid 2000s. Peña died on October 5, 2006 due to a massive heart attack, according to reports from Super Luchas magazine. The promotion honor their founder every year with the October Heroes Inmortales show. Peña has occasionally been criticized with trademarking gimmicks and not allowing the original performers of the gimmicks to use the name elsewhere. The two prime examples being in the case of Psicosis (the original Psicosis) and LA Park (the original La Parka), who were not allowed to use the names and gimmicks in Mexico. There's no dispute about Pena creating the characters look, but the lucahdors feel they should have some ownership based on inhabiting the names for so long. Pena is in the side plate.